Gives me a chance to collect my thoughts and get a good workout. 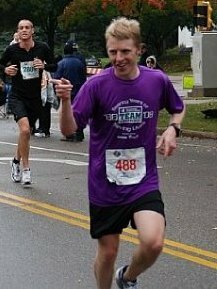 A week after the birth of my daughter I ran the 2008 Twin Cities Marathon. After a week of little sleep and a marathon that was rainy, cold and windy, I ran my PR. To push other myself and other towards a personal goal. Because I’m energetic and a motivator all the while having a good time. Have a good time. We are all going for the same goal.